Published: April 21, 2014 12:00 am Updated: April 21, 2014 2:47 p.m.
KIEV, Ukraine — Vice President Joe Biden on Monday launched a high-profile visit to demonstrate the U.S. commitment to Ukraine and push for urgent implementation of an international agreement aimed at de-escalating tensions even as violence continues. The United States will decide within "days, not weeks" whether Russia is abiding by the accord, a U.S. diplomat said. "It's still too early to tell if this is going to succeed," said Geoffrey Pyatt, U.S. ambassador to Ukraine. "The ball is really in Moscow's court in terms of whether they're going to take this diplomatic off-ramp." The United States has threatened additional sanctions against Russia if the agreement is not heeded. Biden planned to meet Tuesday with government leaders who took over after pro-Russia Ukrainian President Viktor Yanukovych was ousted in February following months of protests. The White House said President Barack Obama and Biden agreed he should make the two-day visit to the capital city to send a high-level signal of support for reform efforts being pushed the new government. Biden will hold talks with Arseniy Yatsenyuk and Oleksandr Turchynov, the acting Ukrainian prime minister and president. He also is scheduled to meet with legislators from across the country and democracy activists before returning to Washington Tuesday night. The State Department, meanwhile, said photos available from social media and other sites show Russia has sent forces into eastern Ukraine. The alleged "concerned citizens" who want more autonomy in eastern Ukraine are dressed the same and are carrying the same kind of RPG-30 rocket launchers that are issued to Russian army troops. There was no way to immediately tell if the descriptions of photographs were legitimate or to independently confirm them. None of the people in the photographs were identified, and there were few indicators to prove where the pictures were taken. 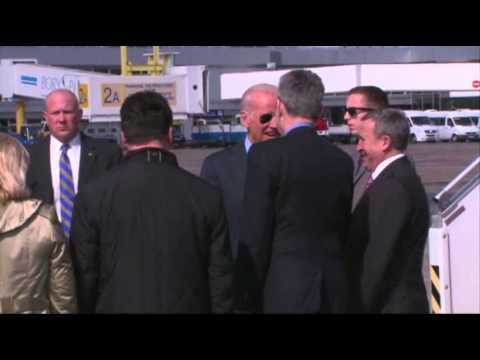 A senior administration official told reporters onboard Air Force Two en route to Kiev that Biden plans to announce new technical support to the Ukrainian government to implement energy and economic reforms. The official, speaking on a condition of anonymity to allow Biden to publicly announce any agreements, said the vice president also will follow up on recent U.S. commitments of non-lethal security assistance and discuss what more Washington can offer to help. Biden also plans to discuss preparations for next month's presidential election and the latest developments in eastern Ukraine, where insurgents are accusing leaders in Kiev of aiming to suppress the country's Russian speakers concentrated in the region. His trip comes a day after a shootout at a checkpoint in eastern Ukraine manned by the pro-Russia insurgents left at least three dead and Ukrainian and Russian officials trading accusations of blame. The armed clash followed Thursday's announcement in Geneva that talks between Ukraine, Russia, the United States and the European Union produced an agreement to take tentative steps toward calming a volatile situation in eastern Ukraine. The official who briefed reporters traveling with Biden said details surrounding the deadly clash are still murky and blamed the difficulty of monitors to get in the area for observation. The U.S. wants the Russian government to use its influence to get pro-Russian separatists to lay down their arms. Russia's Foreign Ministry quickly blamed militant Ukrainian nationalists in Sunday's attack. Foreign Minister Sergey Lavrov accused Kiev of "a crude violation of the agreements reached in Geneva" to ease tensions. The Ukrainian Security Service, however, said the attack was staged by provocateurs from outside the country. Biden plans to warn Russia of mounting costs if it doesn't follow through on its commitments. The U.S. and its allies have prepared new sanctions on wealthy Russians in President Vladimir Putin's inner circle, as well on the entities they run, and administration officials have said they will determine in the coming days whether Russia is making progress or should face the further penalties. Pro-Russian armed groups that have seized police stations and other government buildings in eastern Ukraine said they wouldn't vacate unless the country's acting government resigned. The new government insists it is legitimate, has no plans to resign and is working on constitutional reforms that will give eastern regions a greater voice in self-governance. The Obama administration official told reporters that the assistance Biden plans to announce includes technical expertise to take steps including increasing production in their own fields and boost energy efficiency to reduce reliance on oil imports from Russia. The economic help includes advice to make sure international funding is allocated effectively and that all parts of the country are benefiting.